National Pet Day was founded by Animal Welfare Advocate, Colleen Paige, from Pet & Family Lifestyle Expert in 2006. This day was set aside to celebrate the joy pets bring to our lives and to create an awareness of the plight many kinds of animals in shelters and rescues who are waiting for a forever home. You can read more about National Pet Day here. A special thank you goes to our new pet sitter, Denise, for this photo. Mom Paula likes to receive photos of us each day when she's gone, so Denise was great sending photos. This one was especially great because of our pose. Mom Paula has tried to get a posed photo of the two of us with both of us looking at her for over 7 years. This is a wonderful picture! You two are beyond adorable! Happy Pet Day to you!!!!! Happy Pet Day beautiful girls! Y'all could be the poster kits for National Pet Day. That really is a stunning photo girls! Thanks for joining the Thankful Thursday Blog Hop! Lovely picture of you two!!! What a couple of beauties! Happy Pet Day! Such a beautiful photo! You two should pose together more often! Love that picture!! They probably knew you were after that shot and refused to cooperate. My dog Jack is like that. He's looking particularly adorable and he just stares at me until he sees me grab my phone or camera, and then he turns his head on purpose. Getting my pet sitter to take pictures may be the right solution for us as well!! Great photo! I have a few photos of our three cats. Mostly though, it's difficult to get a shot of them posed together. I need one for a business card, and my husband is trying to create a composite from individual shots. TBT says almost every day is Pet Day here, and we tend to agree! 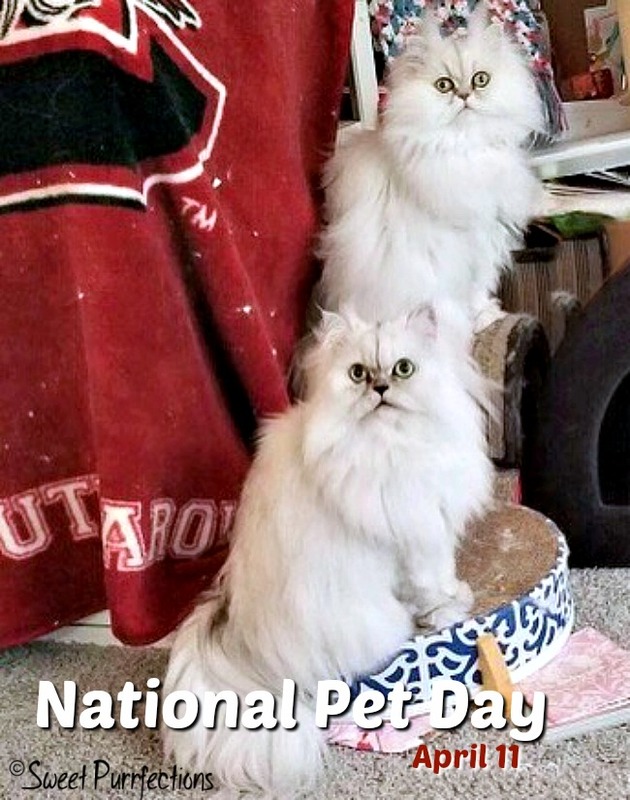 What great ambassadors for National Pet Day! It is a perfect photo. I can imagine how hard that would be to capture because they are perfectly posed - and of course, looking beautiful as always! It's incredible that they look so much alike and yet --- the eyes are SO distinct. LOL well after 7 years I'd say it's worth it Paula! Gotcha! You're girls are beautiful. This is definitely one to keep and frame. I do love the photo, Truffle and Brulee are always so photogenic. I am sure it makes you feel really good about them to get the photos when you are away. I usually send one to my sister when I watch her pets. Gorgeous portrait of you two beauties! She took a fabulous shot. I can see this enlarged on canvas!